General Motors plans to raise its stake in a joint venture that manufactures small passenger vans for the Chinese market, the Detroit automaker disclosed in a regulatory filing Wednesday. 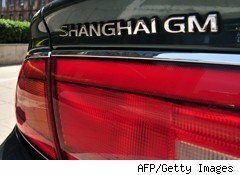 GM entered into an agreement Sept. 30 to purchase an additional 10% interest in SAIC-GM-Wuling for $51 million from Wuling Group, the automaker said. The transaction, should it meet with approval by regulators in China, would give GM a 44% stake in the enterprise, up from its current 34%. Following the transaction, Wuling would own 6% of the venture while SAIC Motor would retain 50% ownership. GM made the disclosure in an updated prospectus for its pending initial public offering, expected later this month. The IPO seeks to raise $10.6 billion through the sale of common stock. Raising its stake in Wuling would help GM increase its profits in China, home to the world's largest auto market. In reporting quarterly earnings Wednesday, GM noted that its International Operations division, which includes China, as well as Brazil, India and Russia, made $646 million before interest and taxes in the third quarter, the smallest profit so far this year. "GM wants to get to the expansion markets and get a bigger piece," Jim Hall, principal at 2953 Analytics,told Bloomberg News. "In China, commercial vehicles have a lower unit profit so the way to maximize profit is to increase their stake." SAIC-GM-Wuling sales climbed 5.1% in October to 93,935 vehicles, Bloomberg reported. The venture has sold more than 1 million vehicles this year. Along with its partners, GM has become the first automaker to sell 2 million vehicles in China in a single year, the company said earlier this month.